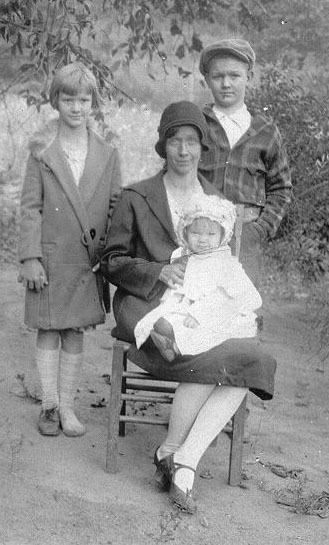 Helen Idella Abernathy, daughter of Reuben Bartow Abernathy and Bertia Evelyn Cox, wife of Lee Edward Deal, former wife of Grady Willard Abernathy. Lee Edward Deal, 89, of Woodstock, died Monday. Services were scheduled Wednesday at Collins Funeral Home Chapel, with the Rev. Charles Callahan officiating. Burial will be in the Old Macedonia Cemetery. A longtime resident of Acworth, Mr. Deal retired from Unique Knitting Mills after 35 years of service. He was a Baptist. Survivors include two sons, Hoyt Deal of Woodstock and Bobby Lee Deal of Edgewater, Maryland; three daughters, Hazel Joyner of Conyers, Edna Mae Farist and Ruth Clement, both of Acworth; two stepsons, Bill Abernathy and Harvey Abernathy of Woodstock; two stepdaughters, Barbara Robinson of Acworth and Mary Belle Prather of Cartersville; one sister, Geraldine Landers of Winston; 11 grandchildren, 15 great-grandchildren; one great-great-grandson; and several nieces and nephews. 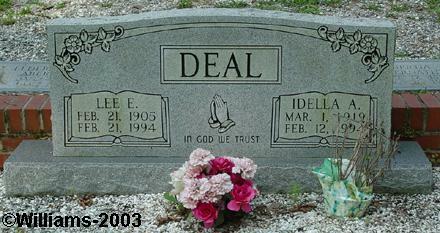 NOTE: Lee Deal was married to Helen Idella Abernathy of Bartow County. Helen died nine days before Lee on February 12, 1994.